Apples & Caramel. Yes! Salt & Caramel. Yes! So why not all 3? Have you been apple picking yet? You should go. Right now. It's not the best thing Bobby Flay ever ate for no reason. Just sayin. Modified from the Four and Twenty Blackbirds Version seen on "The Best Thing I Ever Ate"
Line a pie plate with the prepared bottom crust. If you like, cut the top into a lattice, or just leave as a single piece. Place in fridge to rest while making the pie. Preheat the oven to 400 degrees F. Slice apples thin. A food processor fitted with a slicing blade works perfectly! Toss in lemon juice & bitters. Mix sugar, flour and spices together and sift over apples. Toss to distribute evenly. Pack 1/3 of apples into prepared crust. Brush with 1/3 of the caramel sauce. Repeat. Top with the final 1/3 of apples. Cover with crust and crimp to seal edges. Brush crust with a thin layer of caramel and egg wash. Reserve remaining caramel for serving. Sprinkle with castor sugar and salt. Place pie plate on a sheet pan with sides to prevent the caramel from bubbling over onto the bottom of your over. Bake for 20 minutes on the bottom rack, then reduce the heat to 350 for another 20-30 minutes. When golden, bubbly and the apples are just cooked though, remove and let cool. Serve with a drizzle of salted caramel sauce. Cook the sugar & water together in a tall, heavy saucepan over medium heat until sugar dissolves. Add butter and bring to a slow boil. Let this happily bubble away until its a deep copper color (Watch it so it doesn't burn! Wisps of smoke mean it's time to start over). As soon as you get that lovely roasty toasty brown, remove from heat and add cream and vanilla. Watch it boil up like a witches brew then continue to simmer, stirring occasionally, until smooth. Stir in salt. Let cool. Before you turn to your Spanish dictionary for confirmation, yes, these tacos are made from beef tongue. Please don't run away kicking and screaming, you'll really be missing out! I pride myself on not being a picky eater. That being said, I have never really eaten or cooked any sort of offal - "the nasty bits" as Anthony Bourdain would say, nose-to-tail, the organs that often get discarded. To be honest, I'm afraid. Very afraid. The smell of liver and onions that would permeate our house once a year as a child still gives me nightmares. I don't like pate, foie gras or any other "delicacy" made from those other cuts. But I do want to try new things, grow some cajones, conquer my fears and explore different cultures. Traditionally (and in many places even today), meat was very expensive and these were often the only cuts the average person could afford. They learned how to cook them well, make them delicious, and many of our favorite dishes today were the result of such ingenuity. I figured that the best place to start my foray into this whole new world was with a cut that was still a muscle, just like the steak harvested from other parts of the cow. I'd heard good things about beef tongue from everyone who'd tried it and it's almost a religious experience for taco truck obsessives. So when a sign posted at Springfield Farm alerted me to FREE beef tongue (along with livers, kidneys and other, scarier meats), I figured why not. After all, if I didn't like it I could throw it away without the guilt. My philosophy always when trying something new is not to vary too much from the classic preparation. Therefore, I set out to make some beef tongue tacos. And I have to say, I'm so glad I did. Cleaning the tongue was the hardest part, with a bit of an ick factor, because there's no doubt what you're dealing with. Most recipes call for boiling the tongue, then peeling back the skin, but I chose to cut the skin off first so that I could sear and braise the meat. Although this was a bit more difficult then cooking it first, I think it allowed me to develop more flavor and quickly disguise the cut for the squeamish. Once braised in a tomato and chile based sauce, it was tender and super flavorful, the essence of what a beef taco should be. At this point, it looked and felt just like pot roast, not scary at all. If you're on the fence, do give it a try. Sandwiched in a corn tortilla with fresh salsa and sharp cheddar, I honestly think these might be the best tacos I've ever had. Note: this makes WAY more sauce then you will use for the amount of meat, but it is necessary to properly braise the meat. The extra freezes well and is a great enchilada sauce or base for a mexican soup or chili. Bring a large pot of water to a boil. Prepare an ice bath in a large bowl. Slit each tomato with a paring knife. When the water is boiling, add the tongue and boil for 5 minutes or so. Emerge in ice bath to cool down. Use a sharp serrated knife to trim away the tongue of all skin and any meat that seems to have an odd texture (such as where the tongue attaches to the mouth of the cow) and discard. Meanwhile, immerse the tomatoes in the boiling water until their skin starts to peel away, then plunge them into an ice bath. After they've cooled, peel and remove any tough cores, then set aside. Drain your pot of water, add 1 Tbsp of oil and put over medium high heat. Split the tongue into 2 pieces, preferably similar in size. At this point it should resemble a chuck roast or another normal beef cut. Rub each piece with the spice rub. I used McCormick's Cowboy Rub. Any sort of Mexican, steak or BBQ rub will do. Sear the tongue on each side until well browned. Remove and set aside. Add the remaining Tbsp of oil and saute onions until soft. Add chipotle, tomato paste and seasonings. Saute until slightly caramelized and beginning to brown on the bottom of the pan. Add red wine and stir to deglaze. Reintroduce the tomatoes and tongue and transfer to a slow cooker. Add enough stock to almost cover the meat. Cook on the high setting in the slow cooker for 4 hours. Remove beef tongue. Puree sauce (I recommend a stick blender for this) and bring it to a boil to reduce. Meanwhile, chop the meat. The sauce should reduce until thickened, a little bit less thick then a marinara. When this consistency is reached, heat up a tsp of oil in a small skillet. Fry up the tongue meat (about a cup for every 3 tacos) for a couple of minutes before adding a big spoonful of sauce. Let cook about another minute in the sauce. Meanwhile, spritz tortillas with cooking spray and toast in a large nonstick pan until slightly charred. To assemble, sprinkle tortilla with shredded cheese, pile in meat and top with salsa and other toppings of your choosing. Then sit back and enjoy taco nirvana, preferably alongside a cold Corona with lime. OK, 3rd seafood post in a row. But it's summer and it's HOT and I want light and fresh and that = seafood. So I figured I might as well complete the trifecto. Lobster rolls are a quintessential part of New England summers. They have always been, and will always be, one of my top ten favorite foods of all time. So great that I made appetizer sized rolls for both Christmas celebrations this year. They're something I identify as home and will always link with my father, who has been known to drive all the way to Maine, just for the day, just to have a real lobster roll. And while the classic is great, especially when made with homemade mayo and homemade split-top rolls, sometimes I actually prefer a version sometimes referred to as a Connecticut style lobster roll. Instead of cold lobster salad, here the succulent meat is heated briefly in butter. To me this speaks even more to the simple pleasure of letting lobster be the main flavor. I mixed some scallions into mine, although chives would be better and no herbs at all would still be sublime. One of my favorite breads stands in place of the traditional split top bun. I know they say you shouldn't mess with the classics, but when its lobster, its virtually impossible to screw it up! I used a jalapeno cheddar bread from the local Wegman's, but any soft loaf would work well here. Only 2 things to be sure of: (1) the loaf is not too crusty on the outside and (2) it isn't presliced. Buying the lobster precooked saves time, allowing this sandwich to come together in 5 minutes or less. Remove the lobster meat from the shell and coarsely chop. Preheat a small nonstick pan over medium heat. Split the slice of bread partially down the middle, leaving about an inch still connected like a hinge, forming a "mouth" to stuff the lobster into. Spread butter over the exterior of the bread. Griddle the bread in the nonstick skillet until golden brown on each side. Remove and set aside. Add the lobster meat and the rest of the butter to the pan. Cook just until warm. Toss with chives or scallion. Salt to taste. Assemble the sandwich by layering tomato slices and lobster meat inside the "mouth" of the bread. Enjoy! But all of that was about to change. Thankfully, a veil was lifted from my bivalvian ignorance. There's a great little restaurant in my husband's hometown that has always been one of our favorites. As an undergrad, one of these frequent visits involved my companion ordering a simple dish of fried sea scallops. Since I was at that 20-something-and-realizing-how-little-I-know stage I decided to try one when offered and was immediately blown away by the slightly sweet, salty and tender quality. And my love affair with the scallop started then and there. Since I was currently immersing myself in all things food related, it wasn't long until I came across the preparation that is the holy grail of scallopdom, searing juicy fresh scallops in butter until they're golden brown on each side and just barely cooked through. It quickly skyrocketed to my favorite meal of all time and seems to be the one item on any restaurant menu I cannot resist, even when the other options are more creative and something I might not be able to make myself. 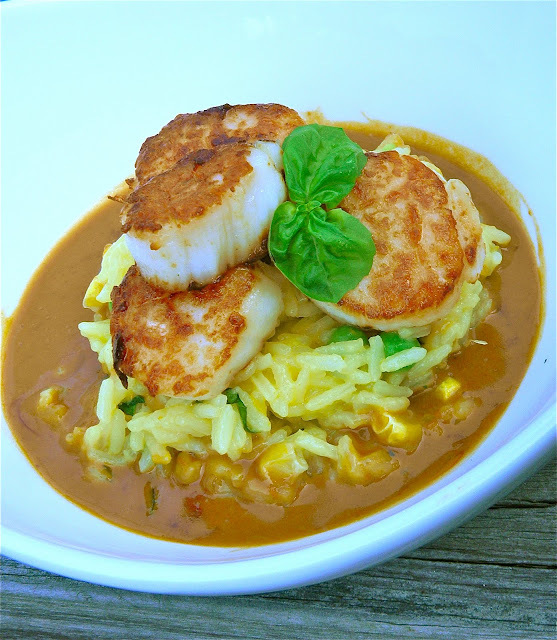 Ever since my scallop enlightenment, I've indulged myself in a seared scallop dish about once a month. Today that treat involved a rich sauce and some buttery rice (which I've had the oddest craving for) with the Spanish flavors of saffron and orange. Be sure to ask for dry scallops that have never been frozen. Other varieties contain too much water and won't sear nicely. 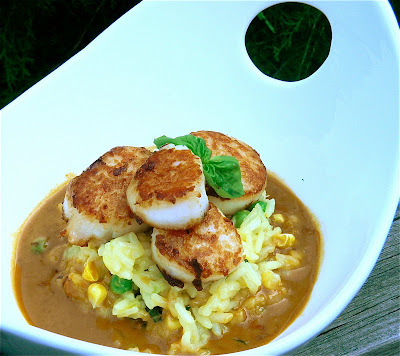 Size does matter, so go for sea scallops over the petite bay version, but it's not necessary to shell out the big bucks for U10s (at only 10 per pound they're huge!) and I find that those cook too unevenly anyway. A medium to large scallop about an inch thick is your best bet. I don't recommend a nonstick pan for this particular recipe. For even browning and the lovely caramelized bits that make the sauce so tasty you really need a stainless steel or anodized aluminum surface. Serves 2 with some leftover rice. To get the sauce started, combine chicken stock, cream, saffron and orange zest in a small saucepan (I use one called a butter warmer because it really only needs to hold about 1 1/2 cups). Bring to a simmer over medium heat and reduce to about half the original volume while you cook everything else. When ready, it will coat the back of a metal spoon. Meanwhile, combine chicken stock, orange juice and zest, saffron, salt and 2 Tbsp of butter to a boil in a medium saucepan. Add the rice, stir and reduce the heat to low. Cover, stirring occasionally to cook according to package instructions. In the last 5 minutes of cooking time, add the veggies. Add the basil right before serving. 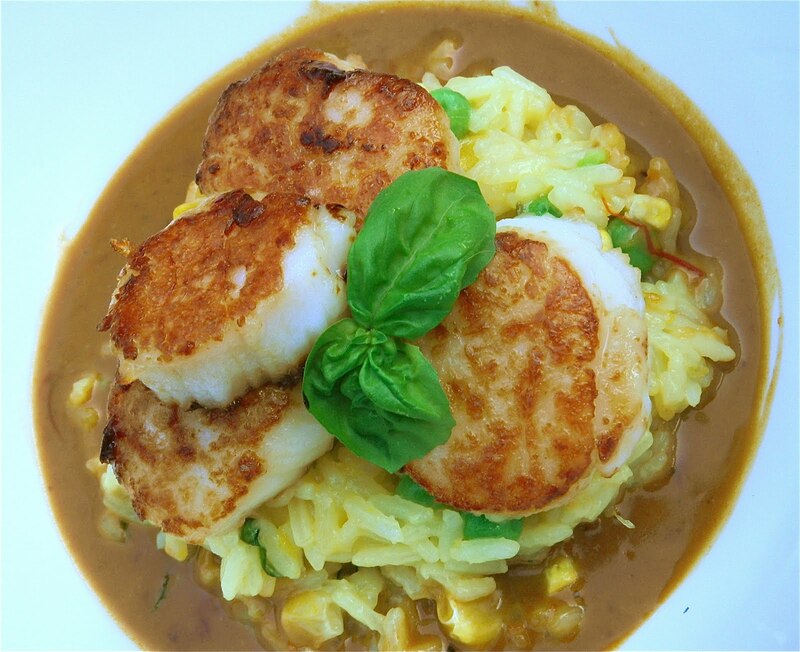 While your rice cooks and sauce reduces, preheat a skillet over medium high heat with the butter and olive oil to get ready to sear your scallops. Pat the scallops dry with paper towels and check to make sure the abductor muscle (a tough little bit) has been removed. When the butter starts to sizzle (but not smoke) place your scallops in the pan with one of the flat sides down. If you've dried the scallops enough and your pan is nice and hot you should hear them sizzle immediately. Cook until golden on one side (usually 2-3 minutes), then flip and repeat. 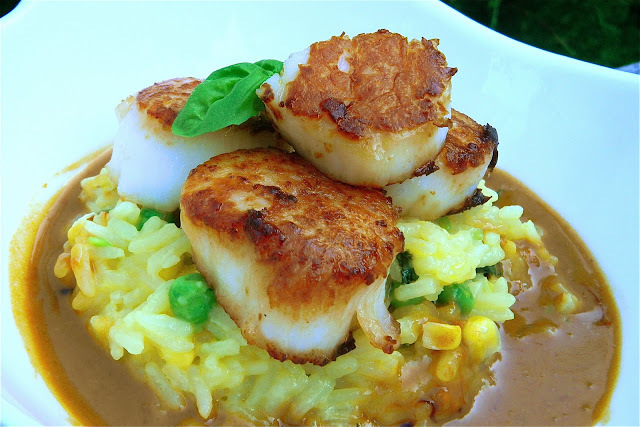 When all of the scallops are golden on both sides and opaque remove them from the pan. (Smaller ones are usually done first so I do this incrementally). To finish, deglaze the pan with your reduced sauce. Let it bubble away over medium high heat as you scrape all those caramelized yummy bits off the bottom of the pan. I skipped this step the first time I made this recipe and what a waste that was! When the sauce becomes thick and turns more golden brown than it's original peachy color, it's ready. Serve scallops atop a bed of rice with a drizzle of sauce over them. Why hello there! Yes it's been a while. But no time for apologies, no time for explanation, I'm just glad you're still here. Let me tell you about something incredible. Something that defines me. Something like Dell's, coffee milk, Rocky Point, Portuguese sweet bread and clam bakes. It's a food so dear to Rhode Islander's hearts that eating it brings back visions of lopsided tables sinking into the sand on a Block Island beach with a Jimmy Buffet tribute band playing in the background. And it's virtually unknown outside of the state! Behold the clam cake! More of a fritter than a cake, it's sort of like a hush puppy embedded with salty, sweet & tender clam meat. Light and fluffy inside, with a crisp exterior and little bits of pleasantly chewy clams. They're great alongside a bowl of chowder (white of course! is there any other kind?) or with a squeeze of lemon or dash of hot sauce. This is the flavor of the Narragansett Bay in summertime. Perfect for this Independence day weekend! Use a large and flavorful clam for this dish. Since you're chopping them anyway, you don't need to shell out the extra money for tender cherrystones or littlenecks. Furthermore, they won't quite deliver the flavor of the larger clams. Remove the clam meat to a cutting board and discard all shells and unopened clams. Coarsely chop the clam meat and set aside. Strain the clam juice through a coffee filter to remove the grit. Some of this will be used later. Don't throw away the rest! It's great in chowders and other soups and it freezes beautifully! Whisk together eggs, lemon juice, 1/3 cup of clam juice, milk, butter, zest and seasonings. Sift in flour, cornmeal, baking soda and baking powder and stir until just combined. Add chopped clams and parsley and stir until well distributed. Fill a heavy cast iron skillet to about a 1/2 inch depth with vegetable oil. Preheat the oil over medium high heat until it is hot but not smoking. At the right temperature the handle of a wooden spoon will bubble when held in the oil. Dollop the batter into the oil about 2 Tbsp at a time, leaving plenty of room in between the cakes. Fry about 2 minutes on each side, until golden brown and crisp on the outside and light and fluffy inside. Drain on paper towels and season with sea salt while still hot. Serve with lemon slices or hot sauce. Savory Zucchini Bread & 2 Tomato "Use-Ups"
Last year when I was (as usual) trying to use up bushels of zucchini, I figured I'd try out a savory version. L was thrilled because it has some of his favorite ingredients and he's not a fan of the typical sweet version. This bread is chock-full of Mediterranean gems and goes great with tomatoes, another bumper crop of the summer. I recommend it aside bowl of homemade tomato soup, topped with slow-roasted tomatoes and mozzarella, or slathered with tomato jam. One thing I would change about this recipe is to scale it up 1 1/2 times because it results in sort of a short stubby loaf. Next time I make it I will see how that goes and update this recipe with new amounts if it works out well. Preheat the oven to 350 F. Grease a 9 x 5 x 3 loaf pan. Beat together the eggs, oil and vinegar. Add the zucchini, garlic, peppers, olives, tomatoes and cheese and stir to coat. Sift flour, seasonings and leavenings into the bowl and stir until all ingredients are well combined. Pour into the loaf pan and bake for 55-65 minutes. Let cool in the pan for 10 minutes. Then run a knife around the edge and invert to remove from the pan. Finish cooling on a wire rack before cutting. The trick to these tomatoes is roasting them as slowly as possible. I put them in the oven in the afternoon and take them out the next morning when I wake up. It's one of those recipes I feel guilty posting because it's barely a recipe. Toss tomatoes with olive oil to coat. Arrange on a baking sheet, cut sides up. Season as desired. Set your oven as low as it will go (mine bottoms out at 170 F). Stick your tomatoes in there and write yourself a little tomato love note so you don't forget about them. Roasting time will depend on your oven but will be at least 12 hours. I usually leave mine in for about 18 hours. You know they're done when they've shriveled to about half their original size but are still moist inside. These freeze very well and make an excellent pasta sauce when roughly chopped. I've seen lots of recipes for this floating around cyberspace and finally had to try it myself. It is the perfect mix of sweet and savory and goes particularly well with salty breads such as the zucchini bread above or any other cheese flavored bread. It's also great as a topping for risotto cakes. It's not necessary to skin the tomatoes but it results in a better texture. This recipe makes about 3 pint size jars. Bring a quart of water to a boil and prepare a large bowl of ice water. Slash the ends of each tomato quickly with a paring knife. Plunge the tomatoes, a pint at a time, into the boiling water for about 30 seconds (you should see the skins start to curl up at your incision), then use a slotted spoon to transfer them to the ice bath. Repeat for other pints. At this point the skins should slide right off. Discard the skins and transfer the "meat" to a large saucepan. Add sugar, vinegar, lemon juice and seasonings and bring to a boil. Reduce heat to low and simmer for 1 1/2 to 2 hours, or until thick and jammy. Transfer to pint jars. This will keep for about 3 weeks in the fridge or 6 months in the freezer (use plastic containers if you plan to freeze it). It can also be canned in a boiling water canner. For this method, make sure your canning jars are sterilized and place your lids in a pan of water just below a simmer to soften the adhesive. Leave 1/2 inch of headspace before placing the lid and making the ring fingertip tight. Boil enough water to cover the jars by at least one inch, use canning tongs to place jars in the rack and process for 15 minutes (longer at higher altitudes). If you haven't canned before please don't rely on this explanation alone - visit the national food safety database or the Ball preserving website first and fully educate yourself on how to can safely. This time of year everyone has extra zucchini threatening to bust out of the produce bin! Although most of our zucchini gets marinated in Italian dressing and grilled, we just can't eat it all. I've already put up 10 cans of zucchini pickles (I most post this some time - they're way better then the cucumber variety), and I have a bag of zucchini fritters in the freezer, so it's time to break out the loaf pan and bake up some zucchini bread. Cardamon is an acquired taste for some, so if it's not your thing I recommend substituting a tablespoon of spicy Saigon cinnamon instead. A dash of cayenne with the cinnamon will make it a delectable Mexican chocolate cake. Preheat the oven to 350 F and grease a loaf pan. Beat the eggs in the bowl of a stand mixer. Add the oil, sugars, vanilla, espresso, cardamom and salt and mix well. Sift in the dry ingredients and mix until just combined. Toss in zucchini, chocolate and nuts and stir to combine. Pour into the loaf pan and bake for 55-65 minutes, or until a toothpick inserted into the middle of the loaf comes out clean. Cool in the pan for 10 minutes, then run a knife around the edge and invert to remove. Let cool completely on a wire rack before slicing. The produce this time of year makes me so excited. Every time I pick up my CSA share I feel like I'm unwrapping presents at Christmas time. What in the world could possibly be better than heirloom tomatoes, sweet corn, watermelon and peaches? With such great produce overflowing out of my fridge, you need some really fantastic dishes to showcase it. Most of these are so simple I don't even post them because it feels like cheating. Is it really a recipe if it takes 5 ingredients or less and involves mostly chopping? Risotto on the other hand is to me the definition of the craft. There's something about chopping and sauteing aromatics, toasting rice, meditatively stirring to coax the rice into drinking up the stock and finishing with a flourish of butter and cream that personifies what it is to be a cook. It's a very zen activity for me because the dish is not difficult, but needs consistent nurturing. I guess that's why I've already given you so many versions, from a homey wintery sausage and radicchio, a bright primavera, and a briny seafood version. This time around I'm showcasing one of summer's mascots - sweet corn. Some gorgeous tomatoes also made their way in there, providing the acid to counterbalance the corn's sweetness and the richness of the butter and cream. Inspired by a corn chowder, it starts with a little smidge of bacon. Some scallions and basil lend a seasonally herbaceous finish. Remove the kernels from the cob and reserve. I love my corn zipper for this job, although now they have this nifty new version that looks like it might be a little more natural to use and remove more kernels at once, so it might be time for an upgrade - future Christmas gift anybody? ;) Snap the corn cobs in half and add them to a medium saucepan along with the stock and milk. Bring to a simmer then reduce the heat to low. In a large saucepan or small stockpot over medium heat, brown the bacon. Once it starts to get crispy add the onion and saute until translucent. Add the garlic and the rice and toast until the rice is golden and smells nutty. Deglaze with the sweet wine and add a couple of ladles full of the stock mixture. Stir the risotto occasionally with a wooden spoon as it cooks over medium heat. It is time to add a couple more ladle-fulls of stock every time you can push the risotto off the bottom of the pan and no liquid seeps in to fill the line you made. Continue stirring occasionally and adding stock for about 20 minutes, then add the reserved corn kernels and continue as before. When the risotto has gotten quite creamy and is almost al dente, add the cream and cook until done (should be 1-2 minutes at this point). Finish the risotto by melting in the butter and parmesan cheese. At this point check for seasoning and add salt and pepper as needed. I don't recommend salting before this point, as the bacon and parmesan both contribute significant salt. Toss in tomatoes and herbs and serve piping hot. Leftovers make great arancini or risotto cakes - top them with tomato jam - assuming you don't lick the pot clean first!